With fingers crossed, engineers monitored telemetry and took in data from the New Horizons spacecraft Monday as it hurtled toward a once-in-a-lifetime flyby of Pluto, and braced for a nail-biting 21-and-a-half hours of radio silence during the most critical phase of the encounter. Streaking through the void at nearly 31,000 mph -- 12 times faster than the bullet from a high-powered rifle -- the compact spacecraft was expected to pass within about 7,750 miles of Pluto's frigid surface at 7:49 a.m. EDT (GMT-4) Tuesday, the high-water mark of a voyage spanning three billion miles since launch nine-and-a-half years ago. "It sounds like science fiction but it's not," said Alan Stern, the principal investigator and a senior scientist at the Southwest Research Institute. 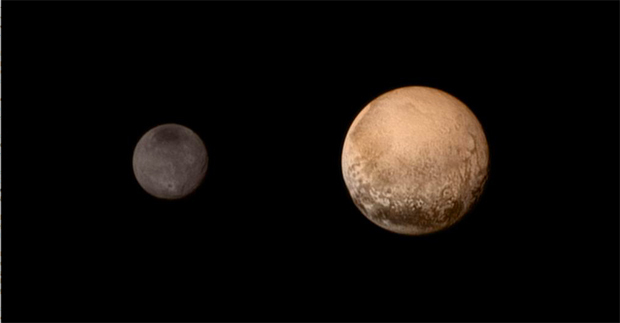 "Tomorrow morning, a United States spacecraft will fly by the Pluto system and make history. "I think this is a great example of a great society and a great nation and what great nations do. And I have to tell you, the data that we're going to produce, in fact the data we're already producing, is a gift for the ages, to all mankind." Because Pluto and New Horizons are three billion miles from Earth -- so far it takes radio signals four hours and 25 minutes to cross the gulf -- and because the spacecraft relies on low-power transmitters and a relative small high-gain antenna, only a small fraction of the observations made to date have made it back to Earth. But the early images show a binary planet -- Pluto and its large moon Charon -- with remarkable diversity, everything from apparent impact craters to rugged cliffs and chasms, broad areas of dark terrain and distinct polar caps. "The Pluto system is enchanting in its strangeness, in its alien beauty, it's showing us tremendous diversity between the two planets in the system and their moons, we are already seeing complex and nuanced surfaces that tell us a history of these two bodies that is probably beyond our wildest dreams on the science teams," Stern said. "Pluto has not disappointed." He said New Horizons detected nitrogen escaping from Pluto's tenuous atmosphere earlier than expected and confirmed that the dwarf planet's polar cap "is, in fact, just that. We now have compositional spectroscopy that shows methane ice and nitrogen ice there. So we've now fingerprinted, it is an icy polar cap after all." Data from New Horizons also shows Pluto is slightly larger than anticipated with a diameter of 1,472.6 miles, plus or minus 6.2 miles. That makes it slightly larger than Eris, another dwarf planet in the outer solar system that has a diameter of around 1,445 miles. "That settles the debate about the largest object in the Kuiper Belt," Stern said. "It also has important scientific implications. Because it's larger, and we've known its mass very precisely for a long time, that means it's a little less dense, which will raise the fraction of ice in the interior that modelers will need to compensate (for) the rock in the interior." Those data are just a taste of things to come, Stern said. The spacecraft's highest-resolution observations will come in the hours immediately before and after close approach early Tuesday. But because New Horizons' instruments and its high-gain antenna are fixed on the body of the spacecraft, the entire vehicle must be constantly re-oriented to aim its cameras and other instruments at Pluto, Charon and the other four known satellites. That means the spacecraft cannot communicate with Earth while it is making its highest-priority science observations. The result is a long radio blackout that will leave scientists on the edges of their seats until contact is restored. Late Monday, New Horizons was expected to send back a final bit of engineering telemetry, recorded science data and a final full-frame image of Pluto. Then, at 11:17 p.m., it was programmed to turn away and resume its encounter observations. From that point, through close approach and several hours after, New Horizons will operate on its own. Finally, around 4:30 p.m. Tuesday, after completing its highest-priority flyby observations, the spacecraft will re-orient itself and aim its antenna back at Earth for a quick burst of telemetry that will reach the Applied Physics Laboratory at Johns Hopkins University near Baltimore at 8:53 p.m.
"That's going to be a very highly anticipated event because it's sort of putting the cherry on top," Stern said. "We know the spacecraft can operate on its own, it's done this for most of the last nine years. But now that we're going through the Pluto system, there is that element of exploration and there's that small element of danger. "So I think we're all going to breathe the final sigh of relief at 9 p.m., and that's when we can really call it a successful flyby." The "small element of danger" Stern was referring to is the slight chance of a collision with unseen space debris that, at New Horizons' velocity, could prove catastrophic. "The combination of the high speed of the New Horizons spacecraft and the exploration nature of this mission could bite us," Stern said. "We've taken what we think is a measured risk. We've searched for debris that may be in the system on approach, we've used our best instruments, and found nothing of concern." Based on those observations, engineers put the odds of a catastrophic collision at 1-in-10,000. The threat is most significant when New Horizons is closest to Pluto, flying through the planet's equatorial plane. "And New Horizons will be out of touch around those hours around closest approach and while I don't lose sleep over this, the fact is tomorrow evening is going to be a little bit of drama. We want to hear the spacecraft check back in, we want to look at the telemetry that's coming back down and want to make sure that the spacecraft hasn't suffered any alarms. "Until we pass that point tomorrow evening, we won't really know, with certainty, that we cleared the system and there were no debris strikes. But I want to emphasize I'm not really worried about that." Launched Jan. 19, 2006, New Horizons departed Earth at a record 36,000 mph and covered more than three-quarters of a million miles a day throughout its nine-and-a-half-year voyage to the edge of the solar system. Stern said it felt "surreal" to finally be on Pluto's doorstep. Because of Pluto's great distance and a nine-hour round-trip light travel time, engineers cannot provide any sort of real-time control over the spacecraft. Instead, it's redundant computers were loaded with a carefully rehearsed sequence of commands needed to carry out a complex science campaign. To make the sequence work properly, New Horizons has to pass through an imaginary box measuring 60 by 90 miles and hit that target within 100 seconds of close approach. While it's too late to alter the spacecraft's trajectory to correct for a major error, engineers built in a capability to change the timing of the observations to compensate. As it turned out, no such updates were needed. "Because the maneuvers went so well on the way in, we're actually already inside the box," Chris Hersman, New Horizons mission systems engineer, said Sunday evening. "So the commands we would need to upload, what we call our 'knowledge update,' are no longer necessary. We're very happy we won't have to do that." While the goal was an accuracy of 100 seconds, he said the actual margin of error was just 70 seconds "so right now, we're feeling pretty good about the next couple of days." Glen Fountain, the New Horizons project manager, said the accuracy of the spacecraft's trajectory was the equivalent of teeing up a golf ball in New York City and hitting a hole-in-one in Los Angeles. "That's the kind of precision that this team has done getting the spacecraft to where we need to go at Pluto, across the three billion miles we've just traveled," he said. "We are good to go for this last bit of the trip." The trajectory was set up to carry New Horizons into the shadow of Pluto after its close approach. With its antenna and ultraviolet spectrometer aimed back at the inner solar system, New Horizons will measure how sunlight and powerful radio signals transmitted by NASA's Deep Space Network antennas are affected by their passage through Pluto's atmosphere. Similar observations will be carried out as New Horizons flies out of Pluto's shadow and then into, and out of, Charon's shadow. It's not yet known whether Charon has an atmosphere or whether it might share some of Pluto's tenuous envelope. Finally, if all that goes well, New Horizons will phone home Tuesday evening with an engineering update to let anxious flight engineers know how things are going. "So fasten your seat belts," Stern said. "New Horizons has arrived at the Pluto system."